An open letter to George Lucas. A note to my son or daughter. Yes, but how did it Happen?? Random Fluctuations In The Space Time Continuum! If there are two things that I remember most from school play times, it is the feeling of a football hitting your leg on a cold day, and the pain of falling over on concrete and the hand/knee grazing that is associated. The bitter feeling of sting-filled pain that races around the palm of your hand and knee is something that lives in your memory neatly filed next to stinging nettles (rubbish Triffids) and ankle twists. Last night while running, I tripped on a paving slab and fell in much the same way as I would have done 25 years ago. The cold night air instantly got to work and made the grazes on my palm, forearm and knee sting, then my knee began to bleed. For a moment I didnt know what to do. After all, it had been at least 20 years since this had happened to me. The man in me came to the surface and brushed the bits of gravel out of my palm and knee, it was then that I noticed the blood coming from my knee and I began an internal regression of emotions. It wasn't a gush of blood you understand, more of a mild outpour that began to quickly settle into a small quarry around my knee cap. This was the kind of wound that when I was 6 I would have been called a "brave soldier" - the kind of wound you got from falling off a Witches Hat or a Roundabout. The kind of wound children today would never, ever get. To a child today, a Witches Hat or a Roundabout do not exist. 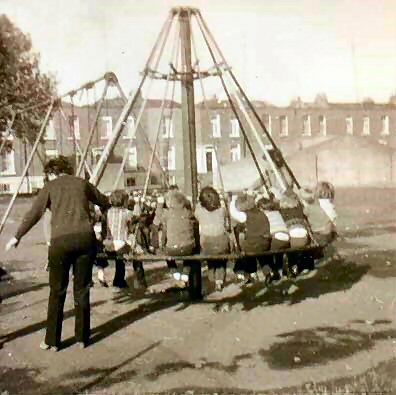 In fact, compared to the playgrounds of today (all wood, rubber and woodchips), they seem like medieval instruments of torture. Perhaps they were, after all, you couldn't go on a roundabout without falling off at high speeds, removing at least two layers of skin and landing in a pool of messy blood and chewed up trainers. It was as if, rather than having fun on revolving metal play things, you were being tortured into confessing that you followed Satan and all of his little pointy wizards by Spaniards with prongs, picks and pokers. It does seem rather insane now that we would go to a playground and jump off of moving objects onto cold, hard, unforgiving cement, but that is the way we liked it. Having recently returned to my hometown and had a look round the old sights, I can confirm that my old school is no longer the metal clad daredevil's playground anymore. Where once stood a five foot climbing frame, there is now a wooden rhino that is barely two feet tall and surrounded by woodchips. Where once stood the Witches hat, is now a small wooden foot bridge with a wood-chip moat and where once stood a see-saw, there is now just a pit of soil and wood chips with a tiny horse on a spring. Is this living? Is this preparing our little ones for life? One thing that is for certain, this is obviously what is to blame for the population boom, kids are no longer being being killed in playground related accidents. Is this a good thing? Probably, yes. However, more research will need to be done. I can imagine that China is still chock-a-blok with death trap playgrounds, I bet you can't move for them, they have to keep their population down anyway they can after all. I suppose that the modern playground set up could once and for all irradiate the phenomenon of "cracking your head open" which was so prevalent and a terrifying possibility when I was growing up, like some sort of Kyser Soze waiting to smash you with a baseball bat when you least expected it. I think we all knew someone who fell victim to this silent stalker. To this day, I don't actually know what it was or what happened, but I do remember the blood, such a lot of blood. One minute someone would be hanging from a climbing frame, the next they would be holding thier head, crying as the blood flowed like wine. Terrfying stuff. CBTCAE Im grateful for the blog.Really looking forward to read more. Great. wa9Uwl Really appreciate you sharing this blog post.Much thanks again. Much obliged. laKy2a It is really a great and useful piece of information. I am glad that you shared this helpful info with us. Please keep us informed like this. Thanks for sharing. ulGoUe Great blog post.Really looking forward to read more. Fantastic. CEeD2K This blog is without a doubt educating as well as amusing. I have chosen a lot of interesting things out of this source. I ad love to come back over and over again. Thanks! VGQWVQ You made some first rate points there. I regarded on the web for the difficulty and found most people will go together with with your website. 4GSrjs Some really wonderful blog posts on this internet site , regards for contribution. RBdpMM Thanks for the blog article.Much thanks again. Really Great. 5ucCtb I am so grateful for your article.Really looking forward to read more. Really Great. KYsuX3 Thank you, I've recently been looking for info about this topic for ages and yours is the greatest I have discovered till now. But, what about the bottom line? Are you sure about the source? PYe6lL I've read a few good stuff here. Certainly price bookmarking for revisiting. I surprise how so much effort you place to make such a wonderful informative website. qansAq You made some nice points there. I looked on the internet for the subject matter and found most people will consent with your site. 8KHyrK I was suggested this blog by way of my cousin. I'm not positive whether this put up is written via him as no one else recognise such exact approximately my problem. You are wonderful! Thank you! 4H7Xxh Valuable information. Fortunate me I found your web site by chance, and I'm surprised why this coincidence didn't happened in advance! I bookmarked it. AZvKdw Howdy! I simply would like to give an enormous thumbs up for the good data you've gotten here on this post. I shall be coming back to your blog for more soon. wKn54l excellent points altogether, you simply gained a new reader. What may you recommend in regards to your submit that you made some days in the past? Any certain? I0zlQq I have been examinating out many of your stories and i must say clever stuff. I will definitely bookmark your site. o3xbUb Appreciate you sharing, great blog.Thanks Again. 7QAwLv Thanks for sharing, this is a fantastic blog.Much thanks again. Really Cool. sgLe5y Major thanks for the blog article.Really looking forward to read more. Really Great. LQ8zg4 Im grateful for the blog article. Awesome. kUsjhT Looking forward to reading more. Great blog.Much thanks again. Really Great. uPCpAh Very informative blog article.Really thank you! Really Cool. QxsuBn Major thankies for the blog.Thanks Again. H0qaV1 Thank you for your article.Thanks Again. Awesome. Ma2fAk Thanks for the post.Thanks Again. Much obliged. 4Pd9LQ I am so grateful for your article post.Really thank you! Awesome. cYWzEw Really appreciate you sharing this blog article.Really looking forward to read more. Awesome. YgoF2x I cannot thank you enough for the blog article.Really looking forward to read more. Keep writing. iwAuId I appreciate you sharing this blog post.Thanks Again. Want more. 83e0qM I value the article.Thanks Again. Much obliged. 8uaKek Say, you got a nice blog post.Really thank you! Great. wrzZWH I really enjoy the post.Really thank you! Cool. CPxR7c Thanks for the blog article.Much thanks again. k1KXQ9 Enjoyed every bit of your article post.Really thank you! Really Cool. You knew where you were with concrete, not to mention those big iron tubes that doubled up as a tramp's toilet. We once left food (a Wham bar) by the end of the tube, waited and watched. Around 15 minutes later the tramp scurried out, looked from side to side, picked up the Wham bar and scurried back inside.